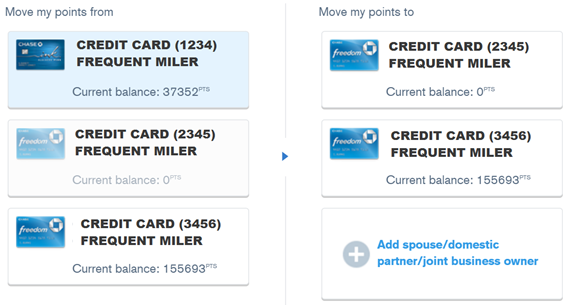 Chase Ultimate Rewards is currently my favorite transferable points program. You can read my comparison of transferable points programs here. Unfortunately, Chase will soon lose Amtrak as a transfer partner, but hopefully they’ll add a valuable new partner to make up for it. One great feature of the Ultimate Rewards program is that you can freely share your points with specific people: your spouse, domestic partner, or joint business owner(s). This is especially helpful when one person has a premium card that allows transfers to airline and hotel programs (e.g. Sapphire Preferred, Ink Plus, Ink Bold, etc. ), but the other person does not. The no-annual fee cards, Chase Freedom and Chase Ink Cash, earn Ultimate Rewards points, but those points are not directly transferable to loyalty programs. So, a person with a Freedom card, for example, can transfer their points to a spouse, domestic partner, or joint business owner, and then that person can transfer points to a loyalty program. Log onto your Chase account. Click on your points balance in the top navigation and select “Combine Points” from the dropdown. Use Ultimate Rewards points to book travel for your friend. If you have a premium Ultimate Rewards card, the points will be worth 1.25 cents each towards travel. To do so, log into your Chase account, select Ultimate Rewards, then click “Use Points… Explore & Book Travel”. I highly recommend comparing prices through other websites (such as Kayak.com). In some cases, Chase charges more so you won’t really get 1.25 cents per point value. Transfer your points to your own loyalty program and book free nights, flights, or train rides for your friend. For example, you can transfer points to your own United MileagePlus account and then book an air award through United.com. The table below shows which programs allow this and which have restrictions. Transfer your points to your own loyalty program and then share those points with your friend. For example, you could transfer your Ultimate Rewards points to your Hyatt account and then transfer your Hyatt points to your friend’s Hyatt account. Very few programs allow this without a fee, though. Please see the table below for full details. Book for friend or family? Transfer to friend or family? British Airways Executive Club Yes Share with those in the same household by creating a household account to pool all of your points together. Details here. Korean Air SkyPass Book for family members only Share with family members by creating a Family Plan. Qualifying family include: spouse, children, parents, siblings, parents-in-law, sons-in-law, daughters-in-law, grandparents and grandchildren. Details here. Note: you will have to provide proof of family relationships. Hyatt Gold Passport Yes Transfer for free once per 30 days. Use this form. Marriott Rewards Yes Yes. Transfer for free. Max 50K points per year unless point transfer is used for a specific award. Details here. Ritz Carlton Rewards Yes Yes. Same rules as Marriott. Details here (see section: Points Sharing). You can move points to another Chase card with Ultimate Rewards belonging to you, your spouse, domestic partner or your joint business owner(s). If we suspect that you’ve engaged in fraudulent activity related to your credit card account or Ultimate Rewards, or that you’ve misused Ultimate Rewards in any way (for example by buying or selling points, moving or transferring points with or to an ineligible third party or account, or repeatedly opening or otherwise maintaining credit card accounts for the sole purpose of generating rewards) we may temporarily prohibit you from earning points or using points you’ve already earned. If we believe you’ve engaged in any of these acts, we’ll close your credit card account and you’ll lose all your points. How about transferring your points to your friend’s loyalty program? Nope. Don’t do that either. Chase has similar language (as above) prohibiting that. Could you get away with it once or twice? Yes, probably. Is it worth the risk? I don’t think so. How informative for the newbies! Something that is often talked about in blogs such as this and even somewhat encouraged, that is not really discussed as much since it is the method used by so many to accumulate points and miles. I wish it also was discussed more for newbies since this is a lesson I had to learn the hard way. Can’t get a Chase card and if I do want one, cannot apply for *any* more cards for a long time if I hope to get one. This is especially bothersome since the constant drumbeat here and everywhere seems to be UR points and INK cards, etc. Can you share what kind of spending you did on Ink to get banned from Chase? In my understanding, unless you are maxing out or close to maxxing out Ink’s $50,000 limit without any other spending, Chase is usually fairly lenient on this issue. @Dennis, Ok, I was not clear. I have applied for too many cards recently to get a card from Chase. The last application when I got turned down, I called them and they told me that even though I have a Chase Amazon branded credit card for 12 years and superb credit history and score, I have applied for too many cards of all kinds, not just theirs so no way I am getting a card right now. This has been talked about a lot in places so i do not even apply for any Chase Cards any more. I am still a n00b but have been trying to learn all I can about this stuff. I am mistaken about the cards, please explain where I am wrong because I am SO tired of reading about 5x ink and URs and all this crap with so many posts I see online and I cannot have these cards or programs. Chase has been fairly strict with opening up new cards. Especially with the notorious 5 new cards in 2 years rules. And I don’t know how many cards you opened, but all banks will be very hesitant to open new cards for you if they see you opened numerous new accounts recently. SO it’s not just Chase. There’s a reason why Chase Ink card gets trumpeted everywhere. Because it’s one of the more generous cards that makes it very easy to collect UR points through MS. It’s fairly easy to accumulate 100,000-200,000 UR points yearly with minimal cost and not alerting Chase. That’s very lucrative. Anyways, I guess I misunderstood your comment. I thought you got banned for “or repeatedly opening or otherwise maintaining credit card accounts for the sole purpose of generating rewards.” It seems that you just have to chill out for a year or two without opening a new card, and you’ll be able to open new cards with Chase. @Dennis, Yeah, that is pretty much how I see it. I may just work around it with what I have now or forget about Chase and do what I have been doing for a while. It is not like I cannot travel or whatever with other point systems. Otherwise, just cool my heels until opportunity comes around again. Thanks for the good words and advise. It is one thing to look at the last 3 (or 6) months application activity. Its quite another to look back 24 months, and apply a ridiculously small limit of 5. This rule will certainly catch just about everyone in our hobby (except true newbies), but also catches a lot of other unsuspecting folks. I really do think Chase’s 5/24 rule is essentially an undisclosed T&C for all of their UR cards, which may lead to some regulatory issues for them going forward. Should people in our hobby limit their total card applications to 5 for the next 2 years just so they can get a Chase card at the end? I think for the vast majority of us it will not make sense, given the opportunity costs involved. I look forward to FM’s promised follow-up on this topic. @Carl, please do not spread misinformation. There are plenty of us who know what we are doing who continue to get new Chase cards despite having 20-30 other new cards a year. You can start by not calling. Most ppl do just fine letting the system run its course. Um, I wrote what they told me, I do not see that as spreading misinformation. Plus I called when I had already been turned down via a letter that said for me to call if I disagreed or wanted to find out more. Stating what they to,d me is hardly spreading misinformation. I may have been uninformed, but I am not stupid. You said you learned this lesson the hard way. Did you have to face this: “we’ll close your credit card account and you’ll lose all your points.”? Or did you simply fail to get a certain card? If it’s the former, I’m really sorry to hear that. If it’s the latter, I have to tell you that the 5/24 rules for UR cards Chase started a few months back is pretty much a common sense for churners now. It has actually been discussed a lot, and a lot of people were turned down by this new rule. So don’t feel too bad about this, you simply missed that part of information. @Vic, No, wasn’t threatened with losing a card or points, though AMEX did the FR thing on me recently and that was a PITA. I am basically unable to get any card from Chase though due to too many apps this year so I have to decide whether to give up on them or cool the app thing for the next 2 years or so. Also I learned that 30+ years is still not long enough since Bankruptcy for Citi to give you a business card. Apparently forever is not long enough of a time frame either. But I started churning right before the Chase rule became better known I guess. But also even my main point there was that there are blogs constantly pushing this card or that card with little caution being given to newbies especially on restraint, etc. I know there is money to be made by bloggers by pushing cards, but all angles should be brought out to folks. Yes, they should research and learn slow but human nature being what it is, well, you know how that can go! If I add my son to my Sapphire Preferred account as an authorized user, can he then move his Freedom points to Sapphire and transfer to his programs? What about if the friend adds me as an authorized user? Shouldn’t this enable me to transfer my friends points to my own account? Could you pls clarify once and for all regarding business card authorized users- does this work? Or does it have to specifically be joint business account owners, each with a primary card? Similar question. What if my brother in law and i both have our own chase ink cards. Can I add my bro in law as an employee to my account, then transfer points to him, which he can then transfer to his own UR account? I recall reports of people shut down for legit transfers. Unfortunately, once Chase closes your account you are pretty much SOL. If I were writing a blog post for noobs on transferring UR, the bolding “Do not do this” would apply to ALL internal transfers. Why risk it? Many have had their accounts shutdown for sharing/transferring points even among close relatives like a mother or father. Be very careful. The terms says spouse/domestic partner or joint business owners. NOT mother, father or other close relatives. Pretty sure Chase can tell when someone earns a bunch of UR via the signup bonus and 5X gift card that they aren’t running a real business with joint owners. Why risk it? I have an Ink Plus account and added my wife as an authorized user/business owner. In March of this year, I transferred points from my Ink account to her United Airlines account to pay for some award tickets on United. So far, so good. In April of this year, I tried to transfer points from my Ink account to her Southwest Airlines account and hit a snag. The Chase agent that helped me informed me that I can transfer points to only one of my wife’s travel partners account per calendar year. Since I had already used United, I couldn’t use Southwest this calendar year. I can do as many transfers to her United account this year, but not to Southwest. Is this correct? I also have an Ink Bold account with my wife as an authorized user/business owner. Do you think I would be able to use that account for transfers to Southwest?